The last year has been a great one for me on the fishing scene. There have been the usual highs and lows, but for the most part the fishing has been consistently good this year. From the Smokies to Yellowstone to the Grand Canyon, this has been the year of firsts and exploration. The early months of the year brought in exceptionally cold weather. January 2011 was probably one of the slowest months for me from a fishing standpoint in quite some time. While I did get out to float the Caney once and even made it to the Smokies late in the month, the general trend was minimal fishing. Things improved quickly as February brought in better weather and opportunities for camping in the Smokies and tailwater floats on the Caney with David Perry of Southeastern Fly. The streamer bite was particularly hot on the Caney. As the month neared its end, the looming trip to the Grand Canyon had everyone excited. The transition between February and March was spent in the Grand Canyon enjoying both relaxation as well as epic fishing opportunities. Bright Angel Creek was the highlight of the fishing part of the trip although the Grand Canyon itself was worth the trip. Returning to Tennessee, I found the spring hatches in full swing. 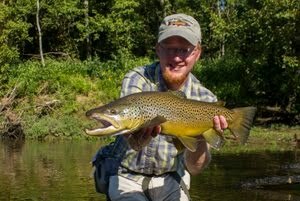 Trips to the Smokies yielded nice browns up to 17 inches on dry flies! 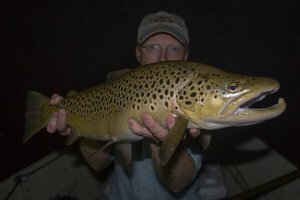 When fish were not rising, they were always more than willing to take our favorite caddis pupa droppers, Tellico nymphs, and other assorted patterns. April brought lots of water to east Tennessee. Most area tailwaters were blown out so we focused our efforts on the Smoky Mountains when able to get out. Some of these trips were weekend trips while others were simply day trips. One of the more frightening moments of the year happened on a hike to Ramsey Cascade when one of my friends got knocked out by a falling limb. Thankfully, she seems to have recovered nicely at this point with no lasting ill effects. Back on the fishing scene, fish were definitely caught during April but the overall numbers were down as I struggled against high water seemingly the whole month. Getting out in May was a little tricky. As a teacher, certain months are more difficult than others to find free time. Fortunately, everything calmed down by the end of the month as we graduated yet another class and sent all the young people home for the summer. The summer slowdown happened just in the nick of time as the periodic cicadas started hatching in late May, bringing about some of the most epic fishing one can experience in these parts. June was one of the best fishing months I can remember, thanks largely due to the cicadas. Anyone that fished the Caney during this time will agree with me. From trout to carp, the cicada top water action was insane. Naturally, I didn't get out enough during this time but that was partly because I was beginning to think about Yellowstone. July was another slow month for fishing. A few trips were made locally on the creeks for smallies and various panfish. For the most part though things were slow. 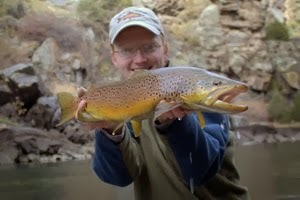 The one exception and highlight of the month was an 18 inch brown caught in the Smokies. By the end of July, we were well into our trip out west. The high water year meant nice stream flows throughout Yellowstone during our time there. The wildflowers were in bloom and provided lots of nice sessions with the camera. Day hikes, long wildlife viewing drives, and plenty of relaxation were the highlights of our time in Yellowstone. As August wore on, we eventually had to head back home, but not before getting in a little fishing while in Yellowstone as well. Back in Tennessee, the month of September was mostly slow for me with minimal fishing. Disaster struck while canoing the Caney when we flipped and my DSLR got fried. Thankfully my old point and shoot Pentax Optio W30 still worked well enough to get me by and proved to be the perfect camera on a Smokies backpacking expedition in search of brook trout. This trip was one of my favorites of the year and the fishing was ridiculous with my first 100+ fish day ever. 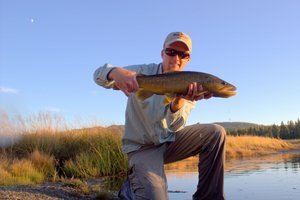 October usually means chasing brown trout and this year was no different. Early in the month though I made it out for some bass and bluegill fun! Teaching some guys to fly fish and catching a few fish for myself always makes for a great combination. Fall on Little River was probably the highlight of the month for me although fishing on the Caney was fantastic as well. 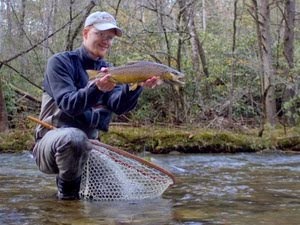 November included some camping in the Smokies with brown trout fishing. One of my favorite things this past fall was the great striper fishing that I've been missing for the last couple of years. Lots of nice fish were caught although that game has slowed down as of late. One of the best months of the year also happened to be the last. December brought the end of a journey I've been on in search of a 20"+ inch brown in the Smoky Mountains. Ever since I was young I dreamed of catching one of these nice fish. The tailwaters also treated me well this fall with fish up to 22 inches on Sow Bug patterns. Another December high point was when we were out chasing musky and boated our very first fish. As the year draws to a close, I can't help but recognize how extremely blessed I am. Lots of quality time was spent on the water this year which translated into some exciting fishing. As we move into 2012, I hope to be able to have at least as good a year as this one was. You have had quite a year. I'd love to pick your brain sometime in the future as the wife and I are planning a trip down into the Grand Canyon. Should be fun. May 2012 see even more time on the water. Shoot me an email if you have any questions. The Grand Canyon is a remarkable place and the fishing isn't bad either... When are you heading into the Canyon?